The Society receives many queries about staff on the former Highland Railway and its successors. Note that these can be seen at General Register House but are held off-site, so you should contact the National Archives of Scotland before any visit. Useful information can be found in the Census records which are now available up to 1911. Start with Scotlands People. Another interesting record of personel can be found in 'Railway Work, Life & Death' which has been produced as a result of an initiative between the University of Portsmouth and the National Railway Museum. Data from nearly 4,000 railway worker accident reports compiled by the inspectors between 1911 and 1915 has been tabulated in a spreadsheet which can be accessed through www.railwayaccidents.port.ac.uk. Unfortunately the Highland Railway although not prominent was not without incident during that period. About 25% of the workforce of 756 served in the First World War. 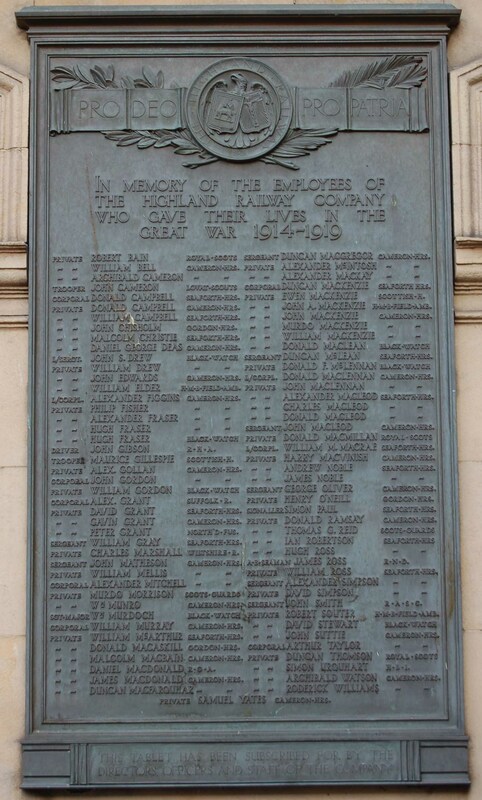 The Highland Railway Company War Memorial is mounted at the entrance to the former Company headquarters, to the left of Inverness station. Click here for a photo of it.